I have been trying to come up with some accessories for the Nursery,Children's Toy shop, etc. 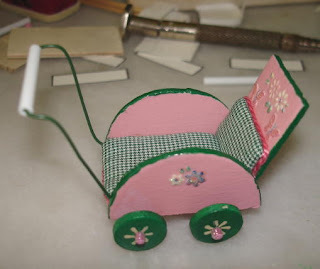 and wanted to share this sweet little stroller that I have made. 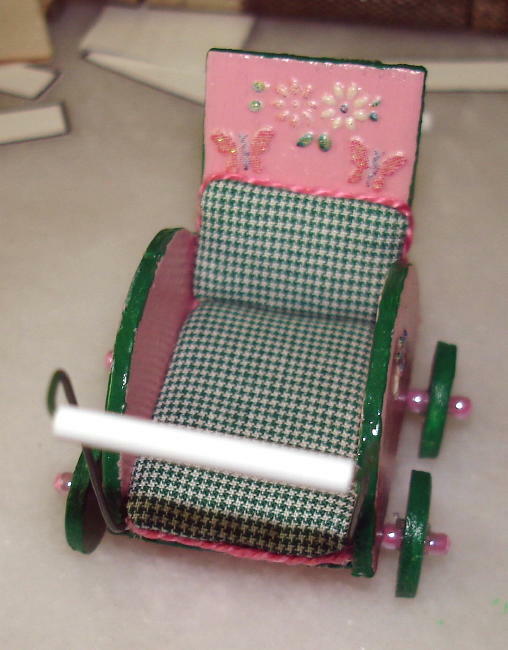 It is perfect for a small toddler to push some of her favorite toys around! I have had this idea in my head for awhile and was so pleased that it came out the way that I had wanted it to. I always seem to build things in my mind for about a week before I sit down and actually start it. It is always a treat if it comes out as planned! The little wheels work too! It is really cute Patty. I can just see one of your babies pushing in through a house. Wow! So cute! I love it. You did an excellent job, this stroller is gorgeous. I love the photo with the toys in it. The stroller is gorgeous. So cute I love it. 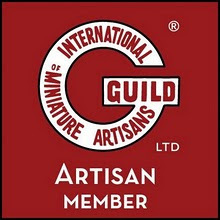 I just became a follower of your blog...and you are so welcome for all of the doll making goodies I sent you. I am smiling as I scroll down your blog posts. My goodness! What a wonderful blog of miniature sweetness!.. 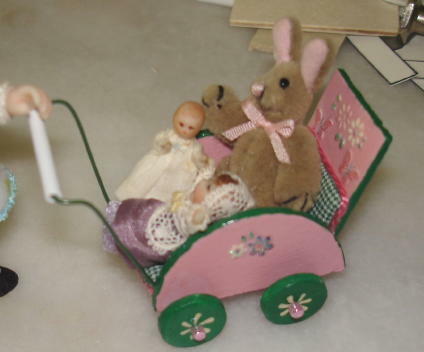 I would love to own a vintage doll house like one my neighbor had years ago. It was a two-story colonial style and only on special occasions did our neighbor open it up for viewing. I was only seven years old the first time I saw it and was so enraptured by the fine details. I know I am going to get my eyes full of wondrous sights here on your blog. Have a very lovely week! I love working with paper clay, it is very addicting. Oi Patty, meu coração bateu mais forte em ver essa beleza de miniatura. Lindo oooooo !!! Congratulations on the magazine article. You are certainly a talented artist.